“The People’s Republic of China is the third largest nation in the world (just behind Russia and Canada) and has more people than any other nation. Although popularly called China, that name was actually given to the country by foreigners who ‘discovered’ this most ancient of all civilizations. China was probably derived from the name of the ruling dynasty at the time foreigners began trading with her: Ch’in. The Chinese themselves actually call their country Chung Kuo, translated to the Middle Country, because early Chinese thought their country was the middle of the world. “Today, however, China is in the middle of Walt Disney World, taking her place in World Showcase along side eight other nations. And American craftsmen are busy re-creating 6,000 years of exquisite Chinese Architecture. 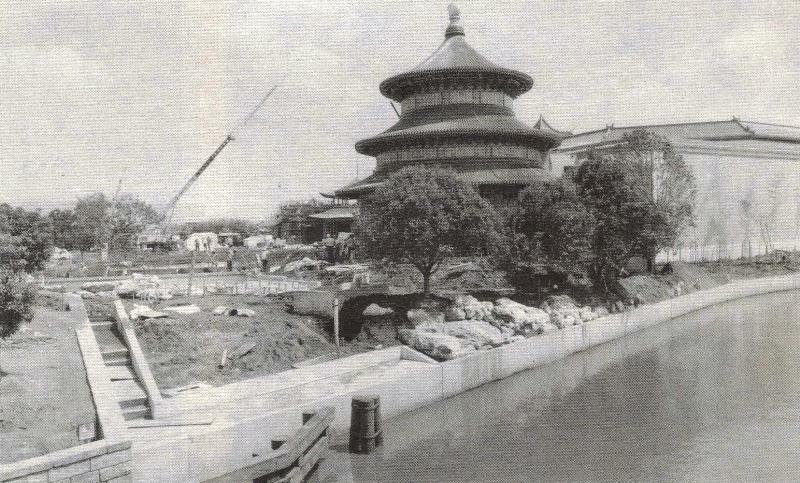 “Beyond the vast entrance gates to the pavilion lies China, bordered by a serpentine wall that protectively snakes its way around the outer perimeter. Out front, two stone lions keep a stern vigil in front of the main entrance. “But once past the tri-arched gate, the world of China transforms into a gently flowing, spectrum of colors and textures. All about are Chinese gardens, representing a thousand years of tranquil gardening, with willows and lotus blossoms abounding. “A color lit lotus pond lies on both sides of a pathway leading to an ornately crafted ‘Temple of Heaven.’ Inside 6,000 years of dynastic rule can be explored in the delicate artwork and artisan care that was required by our craftspeople to produce this original structure. A hallway of photographs will depict china of yesterday up through today. Just beyond is a Circle Vision theater where guests will be transported to regions of this vast country never before filmed. “For the first time, a Disney film producer was allowed to shoot major footage inside the guarded country, using an all Chinese film crew. The crew took the bulky Circle Vision cameras to areas of the country normally considered inaccessible … in some cases by camelback. In one province, the 200 pound camera was carried on the shoulders of the crew up 16,700 steps precariously carved into the slopes of a mountain. “Adjacent to the theater will be an exquisite Art Gallery. Its atrium courtyard will be a museum where 6,000 years of Chinese artwork will be displayed. An agreement was recently signed between Disney and China Group Incorporated, a New York based company specializing in the acquisition of Chinese artifacts and the general promotion of mainland China. (The company is currently providing Chinese artifacts to the World’s Fair in Knoxville, along with operating the merchandising and food concessions in that pavilion). In our agreement, China Group Incorporated is to supply us with museum quality pieces of art and artifacts of interest to World Showcase guests. Some of the pieces will be modern works of art, some will be antiquities, including such items as ceramics and porcelains. “Also included in the pavilion is a merchandising and restaurant complex. The Marketplace, decked out in exotic streamers and banners, will offer a wide range of authentic Chinese merchandise including silk robes and jade jewelry, to bamboo and lacquer chests, to hand crafted paper goods and fans. “The Chinese Restaurant will offer a wide range of Oriental cuisine, form gourmet specialties to fast foods and a bar. Outside the restaurant will be the towering ‘stone throw elephant.’ Legend has it that if a rock is tossed on the pachyderm’s back and remains there, then good luck will follow that person forever.